On the 28th of July was the commemoration of the centenary of battles of the Ourcq. It was a beautiful day with ceremonies around the area. Click here for more details. Click here for more details. The centenary anniversary of the Battle Croix Rouge Farm will commence on July 28, 2018. Download the program here for specific times and locations. 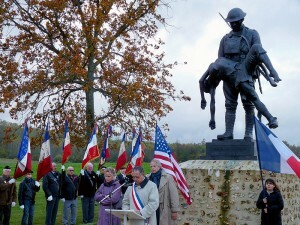 6pm: “Sons et Lumières” at the French monument commemorating the 2nd Battle of the Marne: the Phantoms of Landowski nearby. The Rainbow Division Veterans Foundation is sponsoring a once-in-a-lifetime trip to France to celebrate the 42nd “Rainbow” Division’s World War One Battle History. This tour will include the events listed above. For more information, please download the trip brochure here. 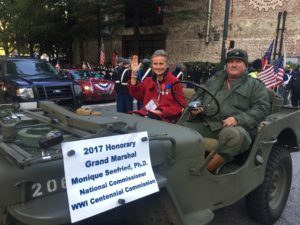 Monique Seefried, President of the Croix Rouge Memorial Foundation and Commissioner for the U.S. WWI Centennial Commission, was recently honored to server as the Honorary Grand Marshal for the Veteran’s Day Parade in Atlanta, Georgia, on Nov. 12, 2017. On August 28, 2017, a bronze sculpture of the Rainbow Soldier from British sculptor James Butler, RA, will be inaugurated in front of Montgomery Union Station from where, on that date 100 years ago, the 167th Infantry Regiment left Alabama to join the Rainbow Division and sail for France. 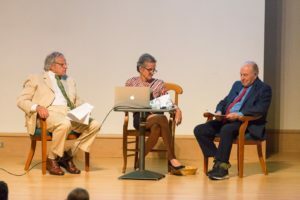 This gift to the city of Montgomery is made by the Croix Rouge Farm Memorial Foundation through the generosity of longtime community and business leader Nimrod T. Frazer, Silver Star.